Surfers Against Sewage Beeswax Wrap Charity Design — The Beeswax Wrap Co. It was in January this year as we were recovering from the Christmas madness that Carly and I started chatting about how cool it would be to work with up and coming designers to create beautiful designs and help them get more exposure, this lead us to think about how much cooler it would be if their designs were inspired by a cause that we could also highlight and donate proceeds from the sale of the packs to. We are so excited to launch our first Charity Design by Jenny Holmes a Bristol based designer in support of Surfers Against Sewage. 10% of all packs sales will be donated to Surfers Against Sewage. Find out more about Jenny and her inspiration for this design and how Surfers Against Sewage will use your donation below. We only have limited stock of our Turtle charity design so to buy a pack and support Surfers Against Sewage click on the link below. How/why did you get into design and why did you choose the process you used? I’ve always loved art. From as far back as I remember I was always drawing or creating something. A few years ago, I moved back to Bristol after living in London for ten years and it was then when I rediscovered my love of nature and art almost simultaneously. For me the two are intrinsically linked. I started block printing three years ago, I love the hands-on nature of it, it can be as detailed or as simple as I want it to be whilst at the same time totally unpredictable. I’m inspired by nature and the environment. Walking in the countryside or along the coast is where I get most of my inspiration, but it’s also amazing what wildlife we have around our towns and cities if you just slow down and look around you. 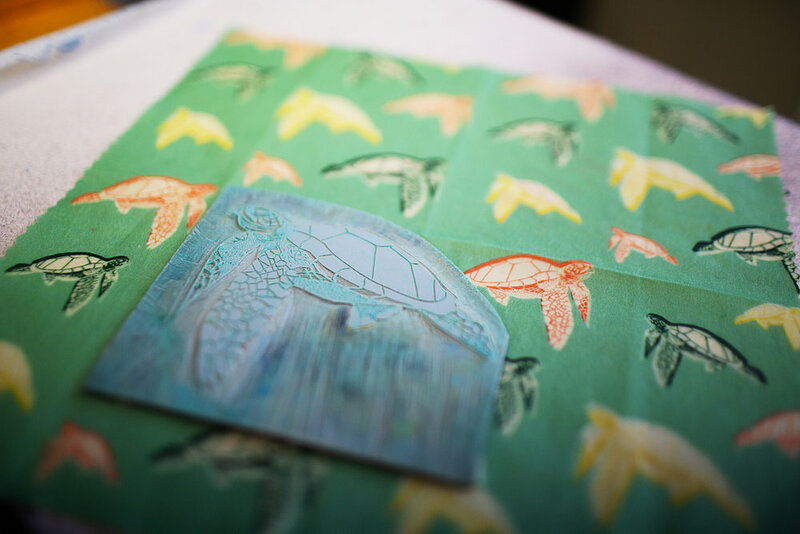 My inspiration for this print came from some time I spent working on a turtle conservation project in Costa Rica. Our oceans are full of amazing wildlife and everyone has a part to play in conserving our natural environment in any small way they can. A reduction in plastic usage is vital which is why Beeswax Wraps and products like it are so great! I love the unexpected outcomes that creative processes can lead to. I find this especially with block printing, I can draw and plan out my design, but the outcome is quite often surprising. I enjoy being able to experiment and learn new techniques as well as sharing skills with other artists/makers. I produce limited edition, original pieces of art all inspired by wildlife/nature in some way. From these I then design notebooks, enamel badges, bags and other items. Founded in 1990 and based in St Agnes, Cornwall they have become an influential and far reaching charity across the UK promoting clean seas and beaches. By tackling society’s throwaway culture when it comes to single-use plastics, they aim to change consumer behaviour and industry standards. Solutions like a Deposit Return System (DRS) would stop millions of pieces of plastic from entering the ocean eco-system in the first place. They are a movement of do-ers, not just talkers. They organise more beach cleans than any other charity in the UK. These events galvanise communities into action – protecting their local beaches for everyone to enjoy. To find out more, to donate or to take part in a beach clean check out their website for more information.